TvNewsLIES.org • View topic - Who loses in war? Board index » Politics and Vital Issues » WAR IS HELL! The Occupation of IRAQ & AFGHANISTAN & ??? The sniper fired. It was a clean shot, if there is such a thing. And down for good fell another U.S. soldier. His name was Sergeant James Dean, but everyone called him Jamie. He was the farm boy who fished, hunted and tossed a horseshoe like nobody else. He was the guy at the end of Toots Bar, nursing a Bud and talking NASCAR. He was the driver of that blue Silverado at the red light, his hands on the wheel, his mind on combat horrors that made him moody, angry, withdrawn. Now here he was, another U.S. soldier, dead. Only Dean was killed at the front door of his childhood home, the day after Christmas and three weeks before his redeployment, shot by a sniper representing the government for whom he had already risked his life in Afghanistan. His wife and parents received the news not by a knock on the door, but by gunfire in the neighbourhood. "If they had just left him alone," says his wife, Muriel. Washington - Six human rights groups on Wednesday released a list of 39 people they believe have been secretly imprisoned by the United States and whose whereabouts are unknown, calling on the Bush administration to abandon such detentions. The list, compiled from news media reports, interviews and government documents, includes terrorism suspects and those thought to have ties to militant groups. In some suspects' cases, officials acknowledge that they were at one time in United States custody. In others, the rights groups say, there is other evidence, sometimes sketchy, that they had at least once been in American hands. So many people lose in this mess. Who turned these hounds over to punish the world--will Bush/Cheney ever pay? Two sets of figures have paramount importance in mainline U.S. media and politics – the number of U.S. troops stationed in Iraq and the number of them dying there. Often taking cues from news media and many lawmakers on Capitol Hill, antiwar groups have tended to buy into the formula, emphasizing those numbers and denouncing them as intolerably high. Meanwhile, the Iraqis killed by Americans don't become much of an issue in the realms of U.S. media and politics. News coverage provides the latest tallies of Iraqis who die from "sectarian violence" and "terrorist attacks," but the reportage rarely discusses how the U.S. occupation has been an ascending catalyst for that carnage. It's even more rare for the coverage to focus on the magnitude of Iraqi deaths that are direct results of American firepower. In the United States, many advocates of U.S. withdrawal from Iraq have focused on what the war has been doing to Americans. This approach may seem like political pragmatism and tactical wisdom, but in the long run it's likely to play into the hands of White House strategists who will try to regain domestic political ground by reducing American losses while boosting the use of high-tech weaponry against Iraqi people. We aren't aware of all the damage our air war against the Iraqis is doing. And most likely we won't be as long as our media refuses to look into it. Last week a military panel recommended that Marine Sergeant Adam Kokesh have his honorable discharge revoked for wearing his uniform during an anti-war protest. We also speak with Private First Class Evan Knappenberger. On Thursday, he wrapped up an eight-day, 24-hour vigil in Bellingham, Washington to protest the military's stop/loss policy. People who have been in the war and want peace are also victims. Everyone seems to be a victim of war except those who profit from it. What are we doing to the Iraq area with our DU (and who knows what else...) And to our military as well. I had gone back to read the beginning of this thread, dori. Thanks for starting it, and I hope everybody will take the time to read all of the links you've provided. Harm to himself...how ironic! Guess that means the sniper was a friend and the young soldier was killed by "friendly fire." "Behind every great fortune lies a great crime." "Democrats work to help people who need help. That other party, they work for people who don't need help. That's all there is to it." "Brian and Gallucci believe that had Barlow's alarms been heeded in 1989, Khan might have been deterred from building the world's largest atomic black market - a network that has since supplied nuclear weapons technology to Libya, Iran and North Korea." Another 'you have to read it to believe it' article. These problems are created by the same type of people, yet those are the very people who make it to the top. Not even the slightest care about what they do to others. And so add whistleblowers to the list of people who are hurt. This man's story is haunting, isn't it! Yes, he might be a danger to himself--but the bullet that took him down wasn't? The person who pulled the trigger wasn't? The United States has shelled out well over half a trillion dollars on the wars in Iraq and Afghanistan, and running costs have hit 12 billion dollars a month, according to an independent report. New figures by the non-partisan Congressional Research Service (CRS) emerged as debate hit a critical point in Washington over the huge human and financial costs of the four-year conflict in Iraq. The report also provided a glimpse into the astronomical costs of US military operations in years to come -- saying the global war on terror could have churned through a stunning 1.4 trillion dollars by 2017. Since the strike on Afghanistan launched after the September 11 attacks in 2001, the United States has spent 610 billion dollars on the two wars, and on protecting US bases worldwide, said the report, updated late last month. Iraq has accounted so far for 450 billion dollars, the report said. In fiscal year 2007 alone, the Iraq operation sucked up 165.8 dollars, an increase of 40 percent year-on-year. CNN DOES REALITY CHECK ON IRAQ WAR! REPORTER SAYS BUSH DISHONORS IRAQI DEAD! Has Michael Moore's chastising of Wolf Blitzer and Dr. Gupta during their interview with him about his movie "SICKO" made a reporter in Iraq want to tell the truth about what's happening over there? Who knows? But whatever the reason, Michael Ware, CNN's reporter in Iraq, seems to be rebelling against the regular ho-hum fluff/lies of CNN about this awful war...good for him, I say, and let's hope he's still alive a month from now. CNN reported Friday that the House of Representatives has passed a bill calling for a withdrawal of US troops from Iraq by next April. However, the bill is likely to be blocked by a Republican filibuster in the Senate and if it survives there will be vetoed by the president. CNN then turned to a "reality check" from journalist Michael Ware in Baghdad on the White House's Iraq report, released on Thursday, which claims progress on 8 out of 18 benchmarks set by Congress. "The authors of this report are far more generous than I would ever be," said Ware. "For example, they suggested there's been satisfactory progress in the area of sectarian violence It's quite a stunning claim ... Here in Baghdad, they're finding less bodies on the streets each morning tortured and executed. But we're still talking about five or six hundred each month. ... It almost dishonors the suffering of the Iraqi people to say that." Ware then pointed out a couple of reasons why sectarian violence might be diminishing even without the efforts of American troops. "About 50,000 Iraqis a month have been fleeing this country or have been displaced," he stated. "So there's simply less targets for the sectarian violence. ... The ethnic cleansing has been successful. ... Finally, we're seeing the American military is now allowing some Sunni neighborhoods to have their own Sunni militias. ... If there's a Sunni militia in your neighborhood, the police death squad can't get to you." I wonder. Does anyone really benefit from war? Doesn't all of humanity and all of the earth suffer? Even those who greedily rub their hands in anticipation of the these destructions do not benefit. They are chasing a false happiness that will never satiate the real cause of emptiness which resides inside them. I wonder. If they were able to have all the wealth and power they want, would they then be happy, or would they still be miserable human beings....everything in hand they thought they desired yet still feeling incomplete. Its funny. Although I can honestly say that I hate the pain and suffering that these fools cause to others, I do not hate the people who are responsible. I instead feel sorry for them because in reality they are nothing. Even the lowest animal on this planet is higher than they. These sub humans cannot help who they are. They can achieve nothing more in themselves because they understand nothing higher. The true shame lies with us who know better. It is us who have allowed the vile beasts to succeed. A lion will do what it does because it is in its NATURE. It is the responsibility of the zebra to remain vigilant if it wishes to remain alive. It is said that money is the root of all evil. I think I disagree with this to some extent. Money is not the root of all evil. IGNORANCE of the higher self is the root of all evil. Greed is just the symptom of IGNORANCE. The war to end all wars can only be fought on the front-lines of the mind. The greatest deception they have perpetrated is that we need them. Our greatest mistake is that we believe them. Ignorance is also bliss where it is applied. Perhaps in their ignorance, they find this bliss? One need look no further than CNN to see this truth. The ignorance of their reporters to the truth is bliss for the American people. 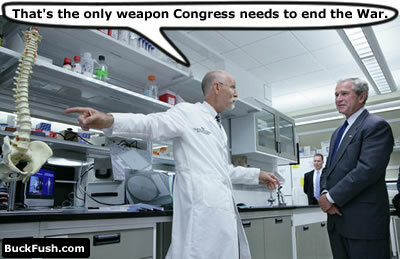 Who says they never found those "Weapons of Mass Destruction" when they were on CNN all the time!! Wolf, McCafferty and Dodds- the 3 stooges. Made the Masses laugh and guffaw at their brainless antics as they "spin" around and around the truth. The only question left to ask is which one's MOE. Which one smacks the others into line? Differing degree's of ignorance I suppose, and this is the scary part. In their ignorance, they think they are doing right, they, in their minds honestly believe they have the justification for what they are doing. Animals are ignorant of the reality that us so called thinking people perceive. They have very few needs and they are just "happy" to be here. They do not think, they just accept. So who is ignorant? Those who live in the REAL reality, or those who live in what they THINK reality should be? JUAN GONZALEZ: What is the impact on the journalists who are in Iraq when you have situations like this of the military just grabbing people and holding them indefinitely without charges? SCOTT HORTON: Well, we have -- I mean, we need to start with the fact that we have more than 110 journalists at this point who have been killed in Iraq. That’s twice the number who were killed in World War II. The number of journalists who have been arrested is now into the thousands. Most of those arrests are simply for establishing identity, and they are resolved in a period of four to six hours, but many of them have gone on for weeks and indeed months, and it is -- you know, it creates continuous pressure on the journalists. But the most disturbing thing here is a tendency on the part of the US military to view these journalists as, quote, “the enemy.” And back three months ago, we actually got to see some classified operational security briefing materials that were prepared by the Department of Defense, in which they labeled journalists in a category together with al-Qaeda and drug dealers as potential enemy, to be treated and viewed as such. That leads to people being killed, by the way.